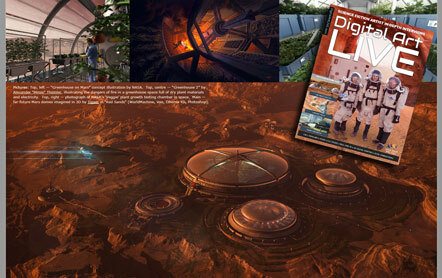 Two of my works were used to visualize articles about futuristic/scifi architecture. 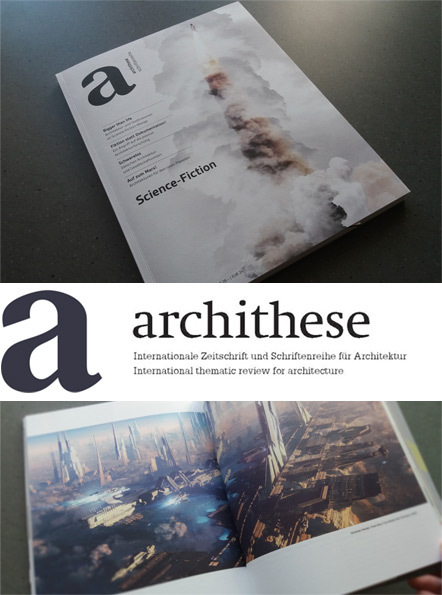 Issue 4/2016 of the swiss architecture magazine Archithese is all about futuristic architecture and its influences. From Here I Can Almost See The Stars is featured on a two page spread in the magazine and Gates To Elysium in an introductory article about the magazine issue. Since I’m no architect, I find it quite interesting that my stuff could possibly be an inspiration, for people working in the field of architecture. 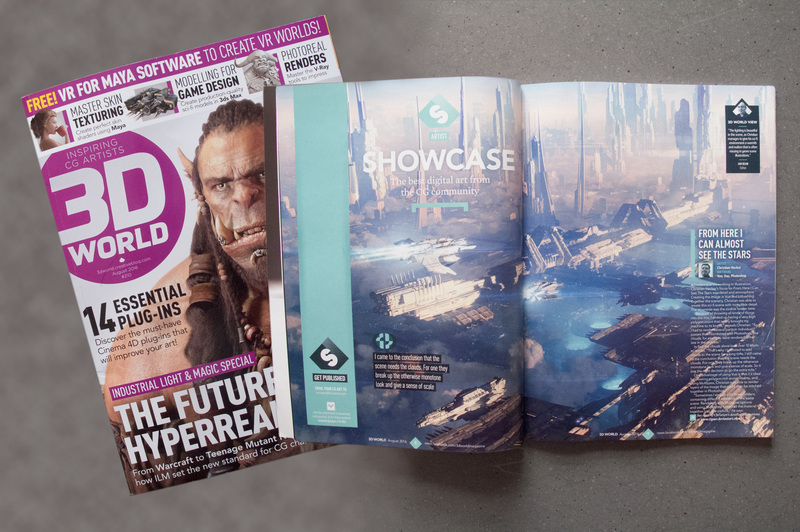 So having my work feature in a magazine like this is really special for me. The word magazine is almost an understatement for this publication. It’s almost a book and feels really good in your hands. It has a nice weight, which gives it a nice feel of quality. 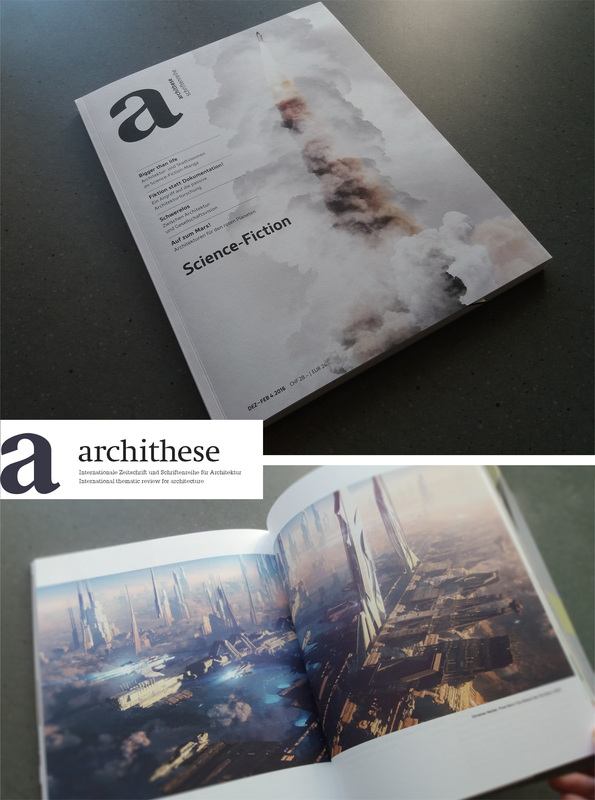 As mentioned before, this issue of the magazine tackles Science Fiction and how it has influenced architecture in real life and media. Movies like Blade Runner as well as Star Wars are discussed. As a scifi fan, working in art, it is quite an interesting read. After a long time trying to get one of my works into the 3D Total Galleries, this year I finally managed to sneak in there. It’s not easy to get your work included there and I want to take this post just to say how cool it is to have finally made it. To have your work side by side with the work of so many other talented folks is a great motivation to keep pushing your boundaries. Now recently I managed to get a third piece of mine selected for inclusion into their gallery and that kind of proves to me that the stuff I create does work. Of course it’s always a taste thing but still, even if you are not the biggest fan of the subject matter a picture or work/project presents, you can still recognize the skill and artistry that went into crafting a project. However, having a three of my works in their gallery is a cool thing! And an article where I wrote a little about the process behind “From here I can see…”. Here we go with the 28th Exhibit of The Luminarium Artgroup. While the future of the group remains a little unsure, we managed to get together once more for another fine release. With a free for all topic our creativity had free reign. The results surely leave a mark and inspires on various artistic fields. Music, Photography and Digital Art of all kinds again shows some neat variety! For your dose of inspiration go here – Illuminate. Here a couple of infos to the upcoming Digital Art Live webinar where I explain the creative process to my Beasts Shall Rise project. If you are interested and you want to participate go here and register for the event. 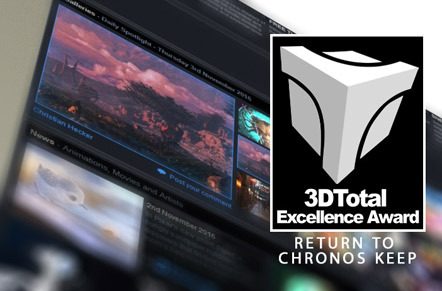 Enter the promocode “vue10” for a $10 discount! The webinar will take place in a Fuze meeting and you will get all info via email. You need to install the client software but you don’t require an account to attend the webinar! Start Time: 20:00 BST (London)/21:00 GMT (Berlin)/12:00 PDT (Los Angeles)/15:00 EDT (New York) – The duration is estimated to 1.5 to 2hrs. If you decide to take part in the upcoming webinar you will also receive an HD recording of the ‘From Here I Can Almost See The Stars’ webinar for free. It’s a scifi cityscape project where I already covered a lot topics in regards to post work for example. 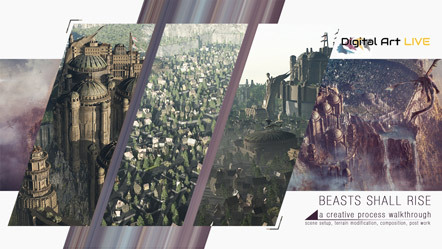 So in the ‘Beasts Shall Rise’ webinar I plan to go into more Vue/3d related material. There is a lot of ground to cover and time flies when talking about these projects. It’s insane. :D So below you find a list with topics I plan to go into. Or better ‘hope’ to go into before the time runs out. I want to make clear though that it’s a project walkthrough and not a tutorial. Even though I plan to go into some practical stuff here and there. Last but not least we'll take a quick look into Photoshop and how the post work brought everything together. I’m very proud that one of my personal favs, “From Here I Can Almost See The Stars“, got a feature in the 3d World Magazine. As usual it’s a fantastic thing to see your work in print next to work by so many other great artists. Good stuff! 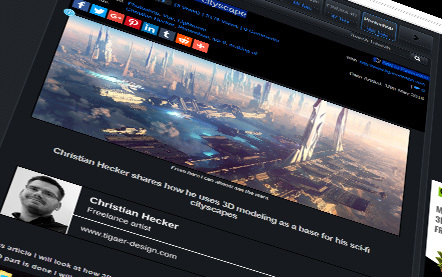 For everyone who cannot get enough about how to create a scifi cityscape, I wrote a little something for 3dtotal.com. It’s not a precise tutorial but I’m going through the creative process behind my ‘From Here I Can Almost See The Stars‘ artwork. A cool thing to be featured on that site. Check it out for the walkthrough and maybe their gallery for some world class inspiration! Great issue with a focus on the future of mankind on Mars. 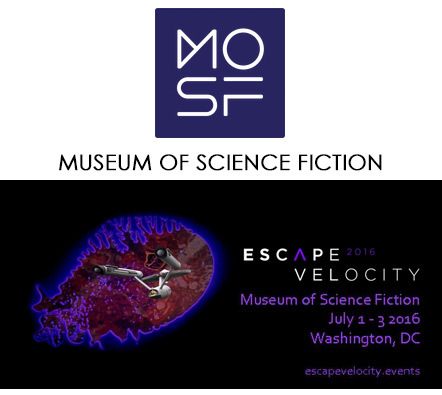 Along with a great collection of scifi artworks! Incl my ‘Red Sands‘ & ‘Terraformer‘ pieces. Well done guys! For everyone who missed it or is just interested… the webinar, where I discussed and deconstructed the creation of my ‘From Here I Can Almost See The Stars’ piece, is now available (digital download in FullHD quality). It’s recorded in HD and has a runtime of 102 minutes.